Whilst being in Europe, we all get excited to go see all of the different countries especially because traveling is cheaper in comparison to America. 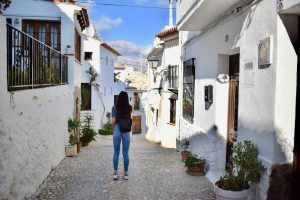 My advice to students who want to study abroad would be to pick a handful of places you absolutely would love to travel to and plan those out. There may be a lot of pressure to hit a ton of countries, but as I have experienced these past few weeks, getting to know the country your living in is an incredible feeling. 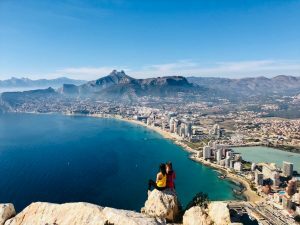 I am studying in Alicante which in itself is a beautiful city, my friends and I have been able to take trips to nearby cities in day trips, discovering hidden gems. A lot of these places have less mass tourism and are much more authentic, allowing us to get an intimate feel for the country we’re in. 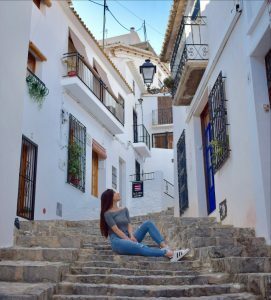 Altea is a small city on La Costa Blanca, or the white coast, which was a small town on the Mediterranean filled with immaculate white homes and buildings. We found a small restaurant where they insisted we get the lasagna, it was the best I had ever had, it was so fresh and rich. It was a lovely city and we had a perfect day. The next day we went to Calpe, another city a few hour from Alicante on train, where we hiked up a mountain there. The view was absolutely breathtaking, you could see for miles, even into other cities. We were above the clouds and able to see beyond the horizon. After, we had dinner on the beach and relaxed along the coast. I have had many of opportunities see the countryside of Spain and have had the pleasure of meeting manylocal people. When I go back to the states, I want to feel like I actually lived here, so I am so glad I’m able to travel within the country and immerse myself in the local culture.